This martini has been the sleek steakhouse’s signature cocktail for nearly 30 years. We understand why. Vodka infused with fresh pineapple is chilled and served straight up to create a timeless classic. 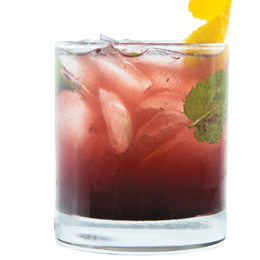 Maker’s Mark and a honey liqueur are the foundation for this inventive cocktail which gets some color thanks to blackberry compote and is finished with ginger ale, lemon juice and fresh mint, garnished with a lemon twist. Cimmaron Tequila that has been infused with thyme is combined with a blood orange liqueur, lime juice and some club soda for a little acidity.